The I-4 Ultimate Improvement Project in central Florida earned the prestigious Envision Platinum recognition from the Institute for Sustainable Infrastructure (ISI) for its sustainability efforts of environmental, social and economic impact on the community and the 21-mile I-4 reconstruction project. This is the first project in Florida to receive recognition from ISI’s Envision sustainable infrastructure rating system. The I-4 Ultimate Project involves the reconstruction of 21 miles of roadway infrastructure from west of Kirkman Road in Orange County through Downtown Orlando, extending to the east of State Road 434 in Seminole County. The project is expected to transform the region by better connecting communities, improving the local economy and enhancing livability for residents. One of the most important benefits will be the improvement of traffic flow by easing congestion with the addition of four new variable toll express lanes and the reconstruction of 15 major interchanges, which includes widening 13 bridges, replacing 74 bridges and adding 53 new bridges, along with a pedestrian overpass on Kirkman Road and a signature pedestrian bridge at Maitland interchange. When complete, the project will provide a visually appealing signature corridor with bold landscaping, accent lighting, enhanced bridge architecture and other aesthetic features. 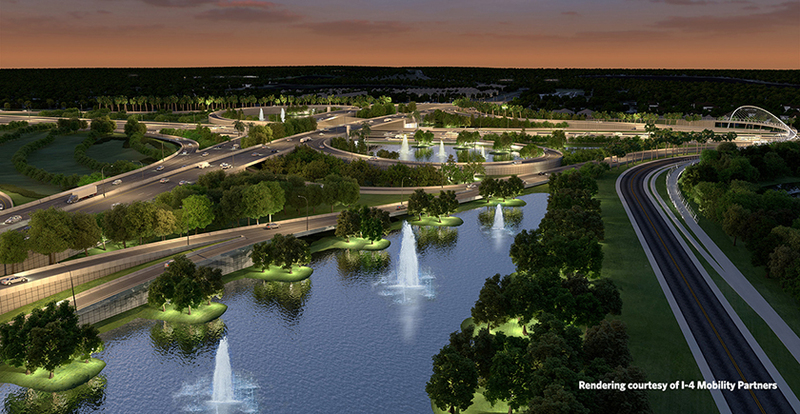 With this recognition, I-4 Ultimate stands to be one of the largest Envision-verified projects. “I-4 Ultimate’s successful implementation of the Envision system proves that building sustainable roadway projects can create significant benefits for the environment and our communities, while serving as a step forward for future infrastructure projects in the nation and beyond,” CEO of I4MP, Wim De Smet added. The project team has further demonstrated its commitment to connecting communities and providing for safe, non-vehicular traffic by including an Alternative Technical Concept (ATC) to build an extra pedestrian overpass bridge over Kirkman Road at the major intersection entrance to Universal St­­­udios.